WE PICK ON THE JIM BOGGIO STATUE at our own peril. The memory of Cotati's eccentric, much-loved, master accordion player--who founded the annual Cotati Accordion Festival, and tragically passed away in 1996--is fiercely protected by the late musician's large circle of admirers. But not everyone who loved the talented Boggio loves the copper-colored memorial statue that now stands in La Plaza Park at the corner of Old Redwood Highway and West Sierra Avenue. Although Boggio's impish grin and stout, bouncy demeanor are perfectly rendered--the artist even caught Boggio's ever-moving left foot in midtap--there are those who feel the life-sized structure is, well, kind of creepy. As one would-be art-critic pointed out, "It looks like an oversized wind-up toy, waiting to start up as soon as someone drops a quarter in his back." It's eerily lifelike presence has caused more than a few drivers to slam on their brakes as they pass by; disbelieving double-takes have become run of the mill at that particular intersection. "It's the grin that gets you," offered another patron. "It's obviously a statue, but the grin is so ... alive. It's like some poor accordion player is being turned to stone before your eyes." On the other hand, it is the statue's lifelike exactness that endears it to many of those who knew Jim. "He was not the stereotypical rock-and-roll musician," says one of the statue's defenders. "Jim Boggio didn't have glamorous good looks." 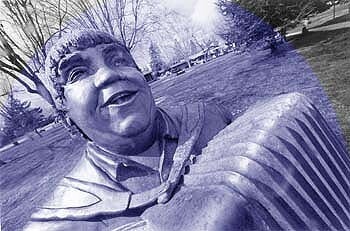 So what a wonderful act of love it was for Cotati to build a statue that looks exactly like him. --D.T.